Is your fleet ready for Winter weather? As the temperatures drop across the nation and the snow begins to fall, ice accumulates, and road crews spread de-icing materials to ease driving conditions. Winter weather is tough for fleet managers, and costs begin to rise. Cold weather and icy roads are hazardous for drivers and their trucks. 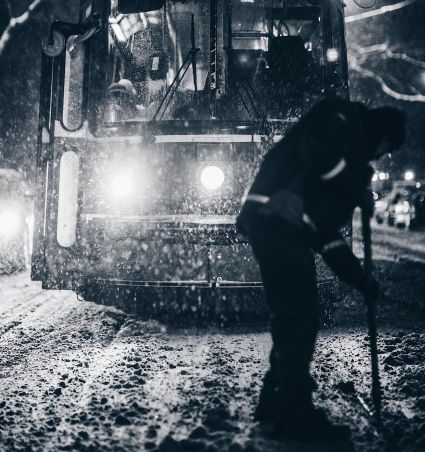 The salt, sand, and de-icing agents used by road crews can cause big problems for maintenance workers and mechanics trying to service the fleet. Washing your vehicles in the cold winter months might seem like a waste of time and resources since they’re going to get dirty again the second they hit the road. But that’s exactly why fleet managers should consider keeping their trucks clean during this time of the year. Road salt, sand, ice, and snow left clinging to vehicle body panels and undercarriages can cause rust and corrosion to set in. And, once rust and corrosion set in it can be costly to repair the damage. Once rust and corrosion damage begins, it is especially dangerous and difficult to reverse. The only way for fleet managers to protect their valuable assets during the cold winter months is to engage in an aggressive fleet washing program. Drive-in truck wash bays with power nozzles are an option. But asking drivers to wash their trucks eats up valuable hours of service in their driver logs -hours of service they should be spending delivering your customer’s valuable freight! Asking mechanics and porters to wash the fleet is also an option. However, mechanics are busy using their skill and training working on maintaining the fleet, and the porters are usually busy assisting the skilled mechanics! For best results, consult a professional fleet washing contractor. We’ve been washing trucks, concrete, building exteriors, and storefronts for over 30 years! ~Even in the COLDEST of weather.